Great news! 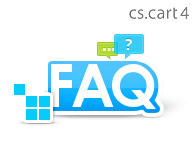 We successfully ported CS-Cart FAQ manager addon to the latest version of CS-Cart. Now it is compatible with CS-Cart 4. It has new cool features and enhancements. We have added 4 new themes, so now you can choose a theme for any design. The module has now become more comfortable and functional. You can massively add FAQ to the products, manage the unique questions, delete, and edit questions. It’s definitely a necessary and useful cs-cart addon. There is more to come. We are happy to announce that FAQ manager plugin is going to have video tutorials. You will be able to see not only how the module works, the most important we will guide you through installation and configuration, available themes and etc. Please see the video tutorials for cs-cart FAQ addon bellow. Stay tuned for more news on cs-cart add-ons updates. This entry was posted in CS-Cart addons and tagged cs-cart addons, cs-cart faq addon, cs-cart faq manager, cs-cart modules. Bookmark the permalink.